SoundBridge uses a disciplined approach, based upon academic and professional research, to find under-valued company stocks and exploit global investment trends. Our methods are quantitative and objective. We create quality portfolios. Benjamin Graham, Columbia professor, investor and mentor to Warren Buffett, wrote the bible on value investing. * His methods were quantitative. We follow Ben Graham’s lead. We create and manage robust, quantitative value portfolios. Value investments have a huge advantage. 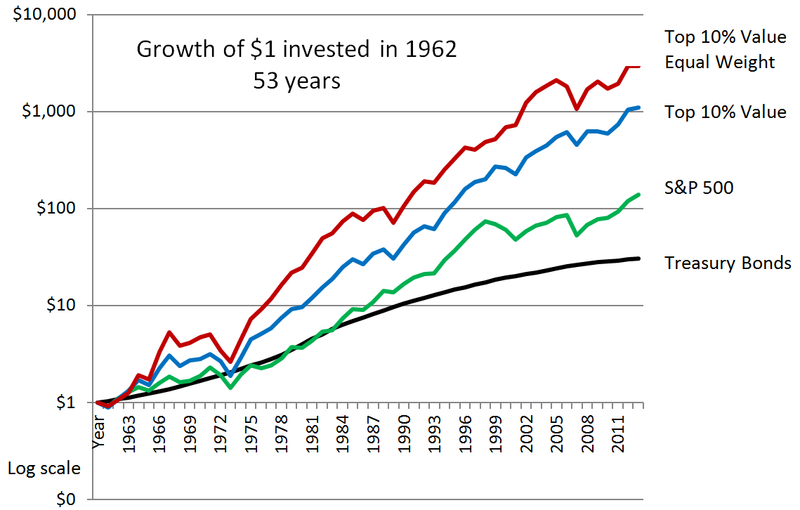 By 2014 an investment in value stocks in 1962 would have gained 21 times more than the S&P 500 index total return. Learn more about value stocks. SoundBridge designs and manages customized value stock portfolios for long-term portfolio growth. We use ETFs, exchange traded funds, for strategies that complement value stock investing for diversification. ETFs are typically low cost and constructed on an index. Complementary strategies include global assets, dividend stocks, trending industry and country funds and income investments. For the best returns, SoundBridge primarily invests directly in value stocks rather than outside account managers, mutual funds or ETFs.